Throughout sub-Saharan Africa, termite-hunting ants battle termites up to five times per day. The ants kill the termites and return them to their nest to be eaten later. Termite soldiers kill and wound many of the invading ants. So the ants have a multifaceted system that deals with injured individuals. It begins with an injured ant sending a pheromone call for help. This is a chemical secretion - similar to a scent - that other ants can detect. Dr. Erik Frank, who is currently at the University of Lausanne but researched these ants at the University of Wurzburg in Germany, found that there are three facets to the system of care that these ants employ. It is similar to triage. 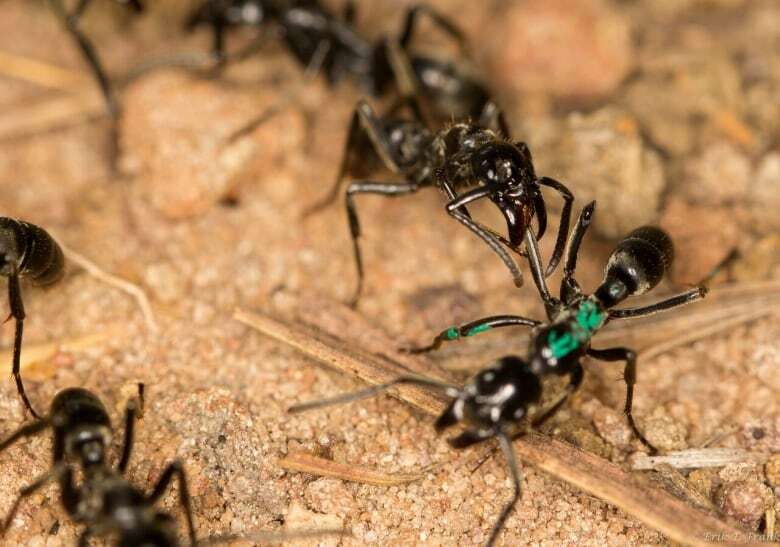 First, an ant that has lost a limb in battle is carried back to the nest where another ant administers cleansing of the wound and some form of 'medication' using its mouth parts. Second, ants that are heavily injured in battle do not attempt to send the pheromone call for help. And third, ants that are lightly injured were observed 'acting' more injured than they really are in the name of providing incentive for others to pick them up and return them to the safety of the nest. Termite-hunting ants live in colonies of one to two-thousand ants, which is relatively small. They also have a very low birth-rate, so it is important for the colony that as many individuals survive as possible. The injured ants learn to run on fewer limbs so they can return to battle termites again. Even though this behaviour is similar to human medical care, in this ant species it has nothing to do with empathy or cognition; social wound treatment in termite-hunting ants is derived from evolutionary selection.